A recent article published in USDA’s Amber Waves, considers the factors that have influenced national WIC caseload decline. Specifically, the article considers the macro level issues, attributing caseload decrease to the declining birthrate and upturn in the economy. The decline is significant: Recent preliminary numbers from FNS show that earlier this year, national caseload dropped below 8 million for the first time in over a decade. A key theme within the issue of caseload is ‘retention’ – why are eligible people either not entering the program or choosing to exit the program? An earlier report from ERS investigating delayed entry and early exit from WIC, found that of the 79.1% of eligible families participating in WIC within the first year of their infant’s life, 17.6% did not enter the program until the infant was born and 22.9% exited the program when the infant turned one. In addition, the report found common traits of participants that exited the program early. For example, families with higher income and higher levels of education were more likely to exit the program, then participants on lower incomes. The national picture reflects similar trends on the state and local levels across much of the country. Given the diversity of WIC programs across the US, there is great value in looking at local level research to add context and build a clearer picture of what we are seeing on a national level. Some state and local agencies have been looking at retention and the issues that cause participants to drop off the program to try and understand decreasing caseloads in their specific locales. 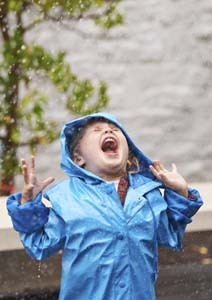 In 2010 - 2011 when the continuing drop in caseload became apparent, the State of Oregon WIC program conducted telephone interviews with a random sampling of participants who had exited the program in the prior month but were still categorically eligible. The interviews included questions about what originally motivated participants to enroll, their experiences with WIC staff, shopping with WIC vouchers, community perceptions of the WIC program, their reason for leaving WIC and what if anything would make them return. 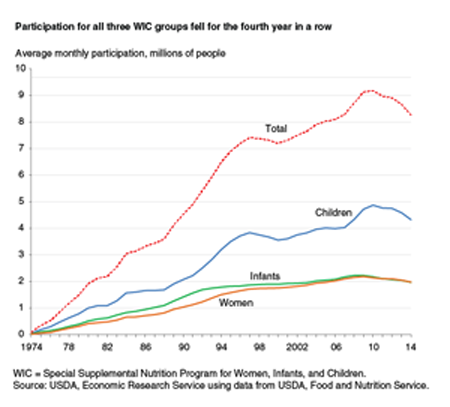 Most participants enrolled in WIC for the food. Experiences with WIC staff were largely positive and participants were grateful for what they had received. A change in life circumstances was a commonly cited reason for no longer participating in the program. Participants also mentioned dropping off the program unintentionally by missing an appointment or having difficulties finding an appointment that worked with their schedule. Conducting the in-depth interviews with former participants helped Oregon WIC staff to explore multiple aspects of the WIC experience for those who had exited the program. After sharing findings with local agency coordinators, approaches for retaining families who may perceive themselves as no longer needing services were discussed. In addition, local agencies took steps to actively track and reach out to participants who missed appointments and unintentionally dropped from the program. 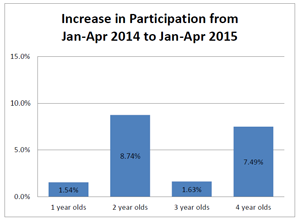 Further south on the West Coast, a recent analysis of caseload in California looked specifically at participation levels of women, infants and children in LA County to examine whether or not there were identifiable trends in participation decrease. The analysis took birthrate into account and surmised that the cumulative effects of the steady decline in birthrate since 2008, was now being felt. This is reflected in the decrease across all children age groups between 2008 and 2014. Additionally, the LA County analysis reflects findings from the 2009 study conducted by ERS, specifically the likelihood that families with higher incomes will exit the program early. Families with incomes below 100% FPL have not decreased, but families with income between 100% FPL and 185% FPL have decreased. Not all agencies are experiencing caseload decline. The Inter-Tribal Council of Arizona (ITCA) have bucked the trend and increased caseload by 6%. Mindy Jossefides, Director of ITCA WIC, attributes the increase in caseload to working intensively to address retention of children in the program. ITCA noticed caseload was down in 2014 and implemented an outreach campaign that focused on making sure families were aware that WIC could provide valuable resources for children. Outreach activities included postcards to families who had left WIC, Public Service Announcements, posters and newspaper advertisements and an idea sheet that gave local clinics ideas to make their clinics more children friendly. Reinforcing the fact that WIC is not only a program that supports pregnant women and infants helped improve caseload for this agency. When it comes to deciphering the factors that influence caseload, it is clear that the picture is mixed. The local level research and the macro level research all play into our understanding around the downward trend in caseload. In the coming years, there will be new research that considers the issue of retention and will hopefully shed more light on the reasons why some families exit WIC early. Both the National Survey of WIC Participants II and the Feeding My Baby Study will explore the experiences of families who exit WIC. The implications of decreased caseload are serious. Not only is the WIC community concerned that eligible families are missing out on important nutrition support, but the number of participants served directly impacts the level of funding states and local agencies receive, which in turn could limit the reach of local programs to engage those that are exiting early or not entering. To mitigate what could become a vicious cycle, understanding why caseload is decreasing is crucial. There are obvious factors that may impact caseload which cannot be controlled, for example, weather, and macro issues such as birthrate and the economy, but research conducted by local state agencies provides hope that there are aspects of caseload decrease that can be addressed through better understanding of the issues at hand. Local agencies and states that are currently focusing on outreach efforts but are still seeing caseload going down, should consider the fact that we don’t know what the decrease would look like without those efforts. We are heartened by states and agencies not settling for the decreases being the ‘new normal’ – sharing examples of how WIC communities are trying to learn more about caseload decrease and respond is useful. If your local agency or state has been looking into this issue, please let us know what you’ve found by emailing Georgia Machell at gmachell@nwica.org. If you would like to learn more about any of the research mentioned in this article, please contact Georgia Machell. The hot topic in our next edition will be “EBT – how will we harness the future goldmine of WIC data."